Blessed be the King that cometh in the name of the Lord. Hosanna, thou that sittest in the highest heavens. If music does not match thee. Mirth only help can bring me. Come music, sick man’s jewel. But thou must now sustain me. Crowd: Crucify him! Crucify him! Crucify him! Crowd: Take him away! Take him away! Take him away! Pilate: What evil did he do? Crowd: We have no king except Caesar. Pilate: Will I release him at Passover? Crowd: Not this one. Not this one. Not this one but Barbaras! Pilate: What did Jesus do? You ordained all things in your heart. To bleach the agony out of his clothes. O how great is the Saviour’s kindness! and bleach the agony out of his clothes. Glorify the Father, the Spirit and the Son. He bleached the agony out of his clothes. Mary Springfels remembers hearing New York Pro Musica perform early music for the first time when she was 14 years old. She immediately fell in love with it and began learning early music instruments in college. For most of her adult life, Mary Springfels has devoted herself to the performance and teaching of early music repertoires. She earned her stripes performing with many influential pioneering ensembles, including the New York Pro Musica, the Elizabethan Enterprise, Concert Royal, and the Waverly Consort. 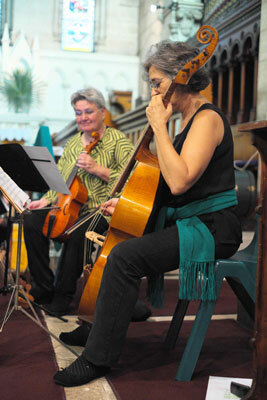 For 20 years she directed the innovative Newberry Consort, and can be heard on dozens of recordings. 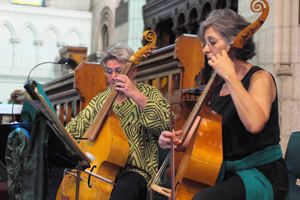 She has taught and performed in summer festivals throughout the US, among them the San Francisco, Madison, and Amherst Early Music Festivals, the Texas Toot, the annual Conclaves of the Viola da Gamba Society of America, and the Pinewoods Early Music Week. After graduating from Sydney Conservatorium of Music, Josie Ryan completed her Masters degree specializing in Early Vocal Music and Historical Performance Practice at the Royal Conservatory of The Hague. She has performed as an ensemble singer with various leading groups across Europe, including The Tallis Scholars, The Amsterdam Baroque Choir and Collegium Vocale Gent. During her 12 years in Europe Josie sang regularly with Pinchgut Opera duringannual visits to Sydney, and now lives here once again since November 2009. Josie has recorded numerous CDs and DVDs and is frequently engaged as a soloist for other ensembles including Australian Baroque Brass, The Choir of Christ Church St Laurence, Coro Innominata, The Oriana Chorale, and The Marais Project. Brooke graduated with a Masters in Early Music Performance from the Early Music Institute, Bloomington, Indiana University, where she studied viol and vielle with Wendy Gillespie and Mary Springfels. As a baroque violinist, Brooke studied at the Royal Conservatory , The Hague with Lucy van Dael and in London with Micaela Comberti where she then spent several years performing with ensembles such as The Hanover Band, The Brandenburg Consort, The London Handel Orchestra and The City of London Chamber Players. 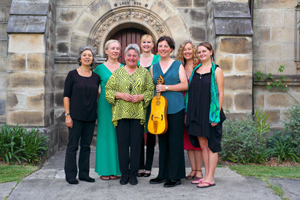 In Australia, Brooke has performed as a soloist with The Australian Brandenburg Orchestra, led various baroque ensembles and played in others led by Fiona Ziegler. From 1993 – 2006, as director of Backgammon, Brooke directed many innovative programs of music on period instruments, in London, Sydney, Tasmania and Honolulu. In June 2011, Brooke founded Josie and The Emeralds. Australian Brandenburg Orchestra. 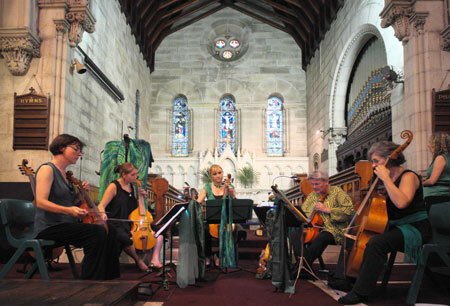 Since 2006 Fiona has been a regular guest of the acclaimed Grevillea Ensemble, and in 2005 Fiona took up the mandolin and became a member of the Sydney Mandolin Orchestra and the Antipodean Mandolin Ensemble. She also leads the Chanterelle String Quartet. 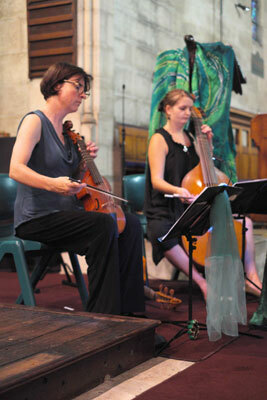 Laura Moore completed her Bachelor of Music Performance at the Victorian College of the Arts in 2010 under the direction of Josephine Vains. During this time she participated in various master classes with Jordi Savall, Jamie Hey and Stanley Richie. In 2011, Laura was selected to participate in the Ironwood Developing Artists Program where she performed works from the 17th and 18th Centuries on period instruments. Laura is also a passionate teacher and values the importance of musical education, particularly in rural areas. 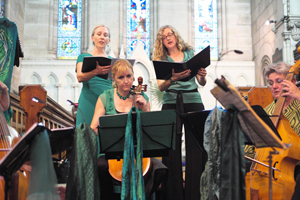 Sydney University Music (Hons) graduate, Margo Adelson, has had many years of experience as a singer, keyboard player (piano, organ and harpsichord) and viola da gambist. On viol she has performed with Sydney Chamber Orchestra, Sounds Baroque, Early Dance Consort, Australian Chamber Orchestra, Jacaranda Consort, Arafura Ensemble (Darwin) and Fleur de Lys. She currently teaches piano and musicianship at MLC Burwood, as well as at her home studio, and conducts the Glenbrook Community Singers. I am delighted to be able to arrange this concert to coincide with Mary Springfel’s visit to Australia. In 2008, during the second semester of my study at Bloomington, Indiana, Mary gave me quite demanding lessons in viol and vielle. I’m still trying to absorb those lessons! In this programme we celebrate the season, with music for Lent, Palm Sunday and Easter. We also aim to tease your brain with some witty madrigals and Renaissance instrumental works. On the contemporary side, Albanese is a protest song and the other works – well, they’re hard to categorise. Suffice to say, spirits of the past loom large but hopefully only haunt in the gentlest of ways. We begin with music for Palm Sunday: Thomas Weelkes’ Hosanna to the Son of David: a popular work in church choral circles, particularly admired for the way it builds up to a resplendent conclusion. This work survives in four secular manuscripts and there are some indications that Weelkes’ may have intended this for a grand courtly occasion. One clue can be found in his text setting. Rather than directly quoting from biblical texts, he avoids biblical acclamations referring to Christ’s triumphal entry into Jerusalem, simply selecting three verses on the subject and adding a Latin peroration. Weelke’s innovative side can be also heard in the extreme chromaticism and abundant word painting of his madrigals O Care, Thou Wilt dispatch Me and Hence, Care Thou Art Too Cruel. The Italian madrigal had been recently introduced to England and he was among a small group of composers who began to adopt Italian techniques such as adding chromaticism to falling intervals to heighten the already popular obsession with melancholy. Even his Fa la las are darkly subdued, unlike contemporary more cheerful settings. John Jenkins’ genial personality has often been remarked upon and this is evident in the sunny opening of the Pavan we are playing today. But one should never take him for granted: in the third strophe of this Pavan, there are surprising harmonic twists. In his Fantasies such as the one we are playing, he seems to delight in creating a turbulent world where nothing can be taken for granted. Seemingly straightforward themes can be varied by one note or one beat, rhythmic displacements abound, points of imitation are never quite where one expects and so the player always has to be alert but seemingly not alarmed! The French 17th century composer Bouzignac typically composed motets in a retrogressive 16th century style. But he was innovative with his creation of dramatic scenes such Ecce homo. In this passion motet, compiled from the four Gospels, Pontius Pilate asks the crowd what he should do with Jesus. Originally for voices, here the part of Pilate is sung by Josie while the viols, led by Belinda represent the crowd’s response. The dissonant cross relations or chromatic clashes in Robert Parsons In Nomine suggest he had something to complain about. Perhaps there was the strain of being a secret Catholic in Protestant England? Or perhaps he truly was a Renaissance ‘choleric’ personality, quick to anger, producing too much yellow bile. The piece begins with a sense of reasonable argument, with the treble viol pitted against the lower three parts. The momentum grows until moderation gives way to furiousness with the lower voices often breaking ranks and appearing to henpeck each other. For this performance, we have restored the original text to the In Nomine line in order for it to be sung and perhaps Josie is our impartial judge finally bringing these disputes to a sense of order. Captain Tobias Hume was a Scottish composer and viol player. Much of his life remains unknown but since he was never accepted into court circles as a musician or didn’t seek to do so it seems that he was forced to work as a mercenary (professional soldier). He published two major collections of mostly solo viol works, trying to raise the profile of the viol to an equivalent or perhaps even superior status of the lute. Good Lord have mercy on me. Shades of Presence Past is an evolving work with ghostly themes. There is also a notion that we in the 21st century can only hope to evoke fragments of the past and these musical motifs will inevitably be transformed by our own dreams. Spirits and Dreams begins with a few renaissance spirits lurking about and these become overlaid with haughty baroque ones. Finally, they all just disappear in a puff of smoke, as spirits do. Graceful Ghost pays homage to William Bolcom’s Graceful Ghost Rag and while it bears no musical connection, I hope it recreates something of that haunting spirit. Spirits and Dreams and Graceful Ghost were premiered in our recent concert at the Glebe Music Festival 2012 and today we are premiering the third but not necessarily the last movement: L’esprit rigole. I have subtitled it The Ghost of Inspector Gadget because Fiona says it reminds her of the theme music to the Inspector Gadget TV show! Questioning is not an adventure but homecoming. The Carny Song paints a bleak environment of a down and out travelling carnival troupe. The Carny (Carnival Man) is a mysterious figure, who suddenly disappears one day, leaving behind his old skin-and-bone nag, Sorrow. When Sorrow dies, the boss, Bellini decides they can’t afford to carry ‘dead weight’ and orders the dwarves to dig a shallow grave. But the body of Sorrow soon floats to the marshy surface, making the dwarves regret they had not done a better job. They are surprised the Carny has not reappeared: one senses he might have magical powers. 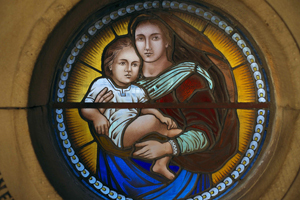 Somehow his revered but uncertain status reminded me of Colm Toibin’s novel Testament of Mary where Jesus is seen by his mother as moving between rationality and irrationality. Hildegard also a questioner, and suffered for her religious convictions and unconventional interpretation of biblical texts. In her chant O Vis Eternitatis she celebrates the Incarnation itself, not Christ’s death, as the central liberating moment in history; and she sees the fallen world freed not so much from sin as from suffering. In Traveling to the Question I have tried to combine these two visions, whereby the transformative one of Hildegard wins out, mostly!